On Friday, November 3rd, walk the Red Carpet in your period costume; think flapper dresses and pearls, boas, cloche hats, bowler hats, suspenders, and walking sticks ~ while enjoying fabulous food, drink and art throughout the House. There will be live performances by the Jazz Loft Trio, and the Salmagundi vintage player piano will be in full swing throughout the night. Take part in a ‘Charleston’ dance demonstration, and have your portrait painted in watercolor in 12 minutes! The highlight of the evening ~ a Salmagundi ‘Mystery Palette’ sale. One-of-a-kind paintings on “Mystery” palettes created by nationally recognized artists will be hidden and then unveiled at 8PM sharp! The fun is that the identity of the artist is concealed until after the work is purchased. The “Mystery Palettes” will sell for $250, regardless of who painted them. Among the works will be palettes painted by Kathy Anderson, Del-Bourree Bach, Chris Blossom, Scott Christensen, Don Demers, Claudia Seymour, John Potter, and John Traynor. In addition to the “Mystery” palettes, a select few will be offered for Silent Auction, such as works by John Stobart, Guy A. Wiggins, Carole Teller and Joseph McGurl. 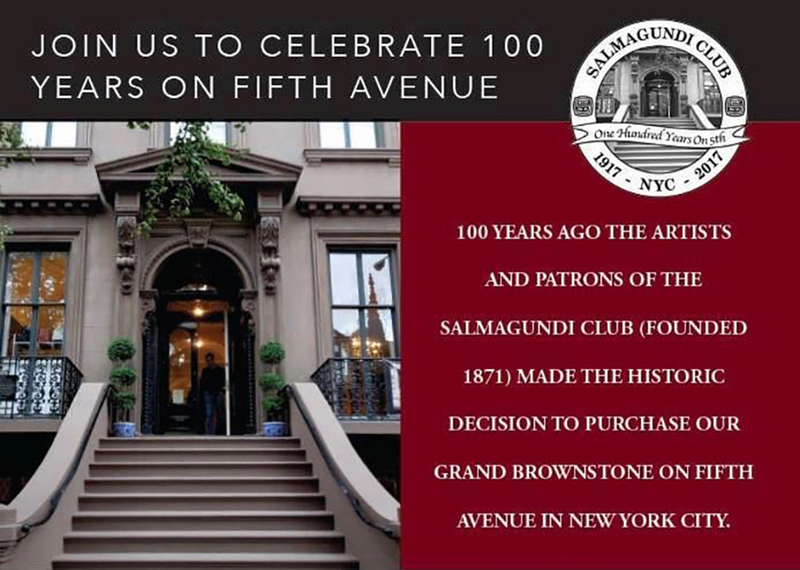 Saturday, November 4th, join Don Demers at 11AM as he speaks about the significance of Salmagundi Club’s building and how it has contributed to life and art within the club. Admission $15, $10 for SCNY Members. The Dining Room will be open for lunch (not inlcuded in package price). Enjoy an afternoon panel discussion at 2PM about Salmagundi and Greenwich Village, moderated by Fine Art Connoisseur editor-in-chief Peter Trippi. Admission $15, $10 for SCNY Members. The Salmagundi Club is located at 47 Fifth Avenue between 11th-12th Streets.